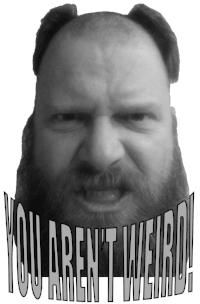 YOU AREN'T WEIRD! — ¡Enchiladas! "Little Mexico is one of those places you can drive by for years and never really notice. It blends in with its surroundings and the parking lot isn't visible from the road." "Steve had heard they served their salsa warm and even noticed a plaque on the wall from winning "Best Place to get Warm Salsa" from the Chronicle sometime in the past, but the salsa was served cool." "There was a good amount of sauce to accompany the huge enchiladas. Cheddar cheese worked its magic and tied everything together like a well loved rug might tie a room together." " As with his guitar playing, Eric Tessmer didn't mess around! He went for the Strait Plate - THREE beef enchiladas, chili con carne, diced onions and two fried eggs on top, over easy in this case." "Don Dario's is a little tricky to get to the first time, tucked in between the highway and Home Depot. Luckily Steve had been there before." "The enchiladas were tasty, especially the filling which had potatoes in with the beef and was nicely flavored." "The charro beans were cooked well and the taste was delicious with some meat morsels bringing some smokiness to the bowl." "Rusty had the verde enchiladas with chicken, which came with a tomatillo sauce and white cheese. Katt went with the supremas enchiladas - chicken with a red sauce and white cheese." "At $7.75 for the lunch special and $2.25 for a tea it's a pretty good deal if you are in the neighborhood. This also happens to likely be the only Mexican food restaurant in Austin where you will see a live Journey tribute band playing." "Matt's El Rancho is an Austin icon with a rich history so the boys had high expectations. It's a big place but they finally arrived at their table and ordered up a couple of Matt's Footlong Enchiladas." "The refried beans at Casa Garcia's were the big standout. Very flavorful! There was pork involved with these beans and that is a good thing." "The sour cream enchiladas are the house specialty, claims the Texican menu, and it would be hard to argue that point. So smooth and creamy and bursting with chicken. They were decadently delectable!" "The enchiladas were decent with a beef filling that was well spiced and flavorful. They were not overly spicy but had a mellower flavor that was subtle. The sauce was more yellow than the traditional red but the flavor was good." "The service at Jalapeño's was great. The food was decent but not spectacular. At $6.99 the lunch special is a great deal even if it doesn't include the drink."